Some brides immediately settle for a designer who can create a custom design. However, there is also a downside to acquiring designer gowns as they could be costly and just does not fit your bill. But at the same time, you want so much to keep that piece of romantic sentiment which is the beginning of a new journey. If you have been searching for an affordable alternative, Caroline Maroh, 32, the owner of www.diva-darling.com offers custom-fit designer inspired gowns. Inspired by the creation of her own gown which she wore during her wedding ceremony last year, Caroline - who is fondly known a Carol - decided that she wants to help more brides-to-be obtain affordable wedding gowns and they get to keep it. "I designed my own wedding gown because I wanted something different from what I can get in the boutiques. Several weeks later guests at the wedding started to enquire about the gown. I don’t believe in spending too much on a wedding gown if you cannot afford it, which is why I decided to look for more decently priced choices and now, I want to share it with more brides-to-be out there," explained Carol. Wedding gowns based on the latest European and Spanish trends and styles are given more focus while Carol tries to keep the essence of traditional gown designs intact. Not just providing more affordable choices, she also strives to meet any customer’s request for a particular design. "On my website, there are designs for selection. Based on these designs, we will improvise on the existing design and create an inspired design which would have almost similar elements. I usually provide advice or work very closely with my clients on creating a gown which accedes to their request," added Carol. Noticing a change in trend as well, Carol sources for gowns which are more contemporary as they are now in greater demand. "Lately, I’ve noticed that gowns are now made with a mixture of organza, stretch fabric and chiffon material. It gives the wedding dress a frilly look but also provides better support for drapes and layers which add more character to a gown," said Carol while elaborating on the current wedding gown trends. 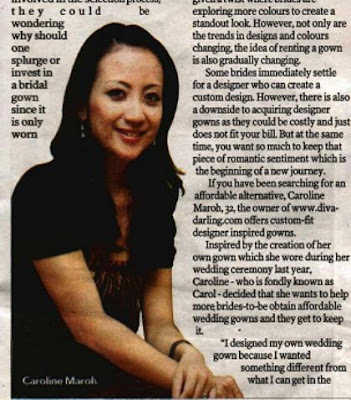 Based in the UK, Carol’s website offers gowns for both Malaysia and European countries as well. "Although I’m not based here, I have a partner who assists me in liaising with Malaysian customers. Proper size guide and fitting measurements are provided before customers make their purchase, so there are no worries about the gown not fitting," added Carol. Ready-to-wear or custom-fit designer inspired gowns include brands such as Linea Raffaelli, Pepe Botella, Pronovias, La Sposa and even Vera Wang and Valentino, while there are also a wide range of evening dresses. Prices range from RM900 and above for custom-fit designer inspired ones while prices for designer ready-to-wear vary. 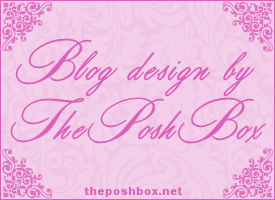 "I also offer personal shopping where I help my clients locate or purchase gowns based on the designs requested. Since I travel a lot, I don’t have a problem searching for that perfect piece," added Carol.